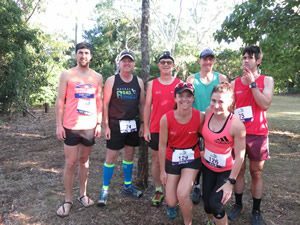 Mackay Road Runners hosted its annual trail running 5km & 9km Club Championship event from the spectacular parkland precincts of the Cape Hillsborough National Park. The weather conditions were perfect as approximately forty runners bolted from the start onto the beach for several hundred metres before hitting the undulating trails behind the Cape Hillsborough Resort. Club President, Tim Magoffin, thanked Race Directors, Martin Lambert, Leon Ryan and Tim Caddy, awesome race day volunteers, Andrew Short and Peter Wright as well as BBQ Chef/photographer Glynis Forse for their exceptional assistance. The annual Cape Hillsborough event, which has been an integral part of the Mackay Road Runners calendar for many years, is highly anticipated among the junior and senior members in accruing vital open and age category club championship points. Junior running sensation, Rachel Silvestri, continued her excellent form from the previous weekend’s Secondary School Cross Country Championships, where she placed second in Queensland in her pet event, the very challenging 4km. Rachel took out the 5km Cape Hillsborough junior club championship race in awesome style, followed by close friend and training buddy, Layla Sanders. Will Morgan bolted from the gun, streeting the field in the early stages before hitting the slight uphill section from the beach onto the gravel carpark section. Carl Pinkstone also continued his outstanding success on and off the road with a resounding win in the 9km two loop race ahead of a very fast finishing Leon Ryan. Carl and Leon have been in great form, both improving significantly with every outing. New Mackay Road Runner but obviously not a novice runner, friendly Irishman, Peter Ledwidge, showed a very clean pair of heels as he displayed excellent running skills to sprint through the very technical course, which included varying terrains from the beach to the rainforest and back. Ainslie Heinke led a strong contingent of female runners in the 9km course, easily skimming over the tough course to take gold ahead of a very fast finishing Kylie Harbour, Jo Skinner, Judy Zahn, June Bradley and Karla Hook. Excellent running also came from Scott McIntosh, Derek Woods, Stephen Oberg, Tim Caddy, Mark Takagaki, Alan Zamparutti, Andrew Short, Bill Morgan, Ross Connor, Tim Caddy, Leanne Connor and Martin Lambert. Many thanks to the friends and family who supported runners as well as staying for the post run refreshments and random draws. 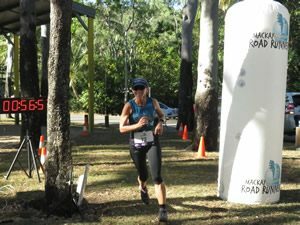 This weekend has a feast of awesome running/walking opportunities including the Mackay Road Runners Sunday social 5/10km at the Bluewater Quay commencing 4pm, the Mackay Mountain run/cycle event at Eungella this Saturday and Sunday and the Run as 1 for Cystic Fibrosis Fun Run on Sunday morning. So get moving, have fun, enjoy whatever options you choose.